Royal Cheshire County Show qualifier Moelgarnedd Stadross recently took out the title of Cuddy in-hand supreme champion at Horse of the Year, much to our excitement! 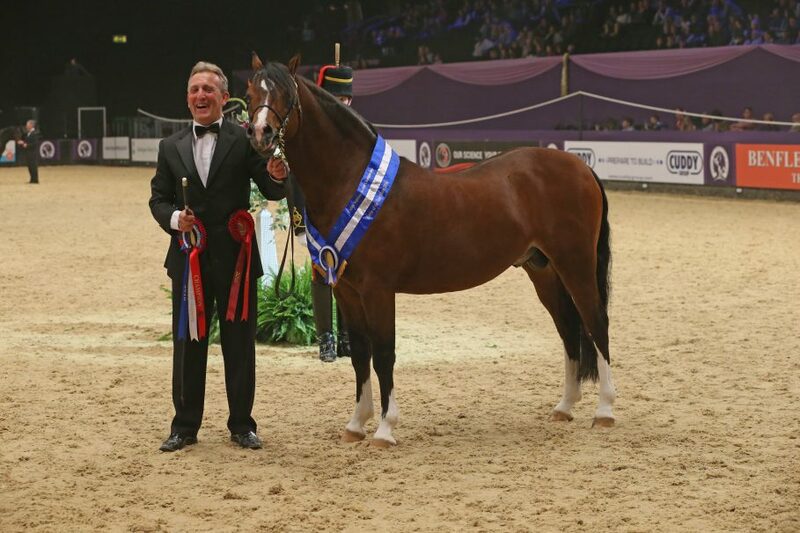 Producer Colin Tibbey led this Welsh section B to victory at Royal Cheshire in June and the six-year-old was awarded this prestigious title at HOYS, held in Birmingham during October. Moelgarnedd Stadross is owned by Gareth Williams and has been used at stud for the last two seasons. Mr Williams, of Moelgarnedd Stud in Snowdonia, Wales told HOYS: “He’s not been out since qualifying at Cheshire county in June. We’re very pleased with him. Congratulations on this fantastic achievement from all your friends at the Royal Cheshire County Show. The next Royal Cheshire County Show is scheduled for Tuesday and Wednesday, June 20-21 at Tabley Showground near Knutsford. Join the event on Facebook and be first to read about event updates and milestones as we count down to 2017 – www.facebook.com/royalcheshirecountyshow. Photo: By E.S. Photography and Horse of the Year Show.